I confess to something that is rare for me. I am at a loss for words (or was when I started writing this) to capture the emotion and creativity and courage and warmth I felt today in the two-and-a-half hour readings of the Bedlam Farm Writer’s And Poets Workshop at the Battenkill Bookstore in Cambridge, N.Y., 12816. Eight students in the class – Rachel Barlow, Jackie Thorne, Amy Herring, Susan Popper, Caroline Ashton, Sandy Van Dyke, Carolyn Smith, Dr. Jen Baker-Porazinski, and alumnus John Greenwood – read their poems and essays and talked about their lives and writing. I have to say it was an intensely emotional experience for me. I’ve been teaching writing for many years, and finally find myself with the dream class, the class I always hoped for and waited for, the class that kept me going – idealistic, empathetic, talented and driven creatives who want badly to write and want only encouragement and a bit of help. Their support for one another is the engine that really drives the class, I am the crank, the voice in the wilderness shouting keep on, keep on. I knew they were talented, but it absolutely blew my mind to hear them read their penetrating work with such poise and feeling, and to see and feel the remarkable responses to them. They were quite a hit. God, I thought, they really are as talented as I thought. This really is a class of exceptional people, and it would take a fool to mess them up. I haven’t been able to do it. Rachel Barlow has been a writing student of mine for nearly six years now, I think we will probably grow old together, although she is much younger than I am. Rachel is a painter, a writer, a cartoonist and publishes Picking My Battles one of the warmest and most beautiful blogs I know of. She has become one of the most successful painters in Vermont. She writes eloquently about her bi-polar condition, she is a loving mother and wife. We had to stop buying her gorgeous paintings, we ran out of wall space. The truth about Rachel is that she is brilliant at everything she does, I know no one who is more creative or enterprising that she is against tough odds. Her presence in my class is a great gift to me and to the students. Creativity takes courage and Rachel is stuffed with courage. The workshop really is a wonderful thing I stumbled into, almost by chance. I can’t quite imagine how we all found each other, a group of people do supportive of one another and so filled with talent and character. My first workshop upstate was in a library outside of Albany, the class was mostly comprised of homeless people, and two or three angry people on various medications. One of the “normal” students was Diane Fiore, a grounded and gifted writer, who paid me the great compliment of coming to see and hear the readings today. Her blog is under reconstruction, she has written regularly and beautifully for some years. When my student Caroline Ashton walked through the door a bit late, I almost broke down and cried. I meet Caroline when Izzy and I visited her husband Noel in our hospice therapy work, he was gravely ill. Caroline, a former school teacher, and Noel, a teacher from Cornwall, were one of the most loving and devoted couples I have ever seen. Caroline was consumed with grief and pain when Noel died, I always sensed the writer and poet in her, from the very first time we spoke. I badgered her for years to join the class. She disagreed, she was not a writer, she told me a million times, she had to work so hard to heal and reconstruct her life. And she has, with bravery and grace. She is one of the most amazing people. Carol loves singing, she is member of a local choral, the Battenkill Chorale. It took me five years to get Caroline into my class, and she finally shocked me by showed up, denying she was a writer to the end. It was the battle of the wills, two stubborn and willful people. I won that battle, but only when Caroline decided I would. One day she brought me a stack of journals filled with beautiful essays and poetry. Not a writer, eh? Caroline is shy and humble, I wasn’t sure she would show up, I know it was not easy for her. She did show up, and read several beautiful poems. She had many in the audience – all the seats were filled – in tears. Me too. What a journey, I’m on her to put her wonderful poems into a book, she is balking, but weakening. I remind her that I had hair when I first invited her into the class, I hope to live to see her blog. Jackie Thorne read some of the haunting and honest and lyrical poems from her new book “To Catch The Light: Selected Poems.” She writes so beautifully about life and its emotional currents. You can follow her website, it’s called Creative Journey Woman. Jackie is thoughtful and passionate animal rights activists, animals are as important an element in her life as they are in mine and Maria’s. She has written eloquently about our moral obligation to share the world with animals as not only just but a part of our history and destiny. I am encouraging her to explore her philosophy, along with her poetry. She has a lot to say that people need to hear. Amy Herring mesmerized people with the wry, wise and deeply heartfelt poems from her new book “Flounder And Other Poems.” She writes with such a great heart about dreams and passions and the struggles of the creative life. Amy is a literary writer, the real deal. Her words sing songs. Jen Baker-Porazinki read a beautiful remembrance to the small but much-loved local hospital that closed in our town some years ago, and where she trained as a physician. She wrote of a place where doctors could care for their patients in a way that is almost unimaginable now. She almost got through it without crying, a number of people couldn’t hear it without crying. Jen is a much-loved family practitioner in our little town, her writing is about the struggles of a caring doctor to keep her humanity in an increasingly inhuman system. Susan Popper read eloquently about her search for a new life in upstate New York, and her farewell to the beloved ocean she left behind in Long Island. She has found her new ocean here, she wrote, in a beautiful hay-field and our countryside. Susan is brave and exquisitely sensitive, she is going to Massachusetts next week to confront her life-long struggle with obesity, and to share her journey on her very authentic blog, Just Susan. Another ocean for her to cross. In my class, I urge my students to find their voice, and to get their work out into the world, by any means available – blogs, self-published or commercial books, poems, paintings, sketches. Any thing that works. They are beginning to do that, we have four books in the works in the class. In the workshop, we don’t permit agents, editors or corporate publishers to silence us or keep us from speaking up and out. We don’t permit anyone to silence us. I have the most deeply felt admiration for Sandy Van Dyke, who is writing a book called “Whiteness.” Sandy, a compassionate Evangelical, spend much of her life as a white person teaching African-American students. She has traveled repeatedly to Africa to work on community development projects there, and wrote of her long friendship with and love for an African woman who died of Aids. Sandy’s poetry is deep and rich. She is self-publishing her book and considering a blog. Carolyn Smith is or newest and fascinating and mysterious class member, she moved to Cambridge recently from Seattle, she came with 13 cats she felt morally bound to bring. She is creating a blog devoted to cats and other animals. She has traveled all over the world and read of her lyrical memories of life in Cambodia as a small child, her father was a British diplomat stationed there. I’ve always had this generalized idea that the British teach their students how to write. Carolyn is reinforcing this prejudice. she is easy with words. And she has some fascinating stories to tell. I am eager to know more about her 13 cats. She is working on starting up a blog. And then, John Greenwood, one of the most creative people I have ever met, a former milk truck driver, he has devoted his life to writing, and creativity, he is a profoundly decent and caring man, as well as a born creative. John reminds me that there are truly nice people on the earth, you will not ever find them on the news. He was one of my first and greatest students. John says the writing workshop changed his life, John also changed my ideas about teaching. His blog, Raining Iguanas, is one of the most creative I have ever seen. The feeling in the book store was warm and open and loving. It was quite special. I had to keep looking over at Maria to ground myself, like so many men of my generation, I never learned to show emotion, but I am full of it, especially today. 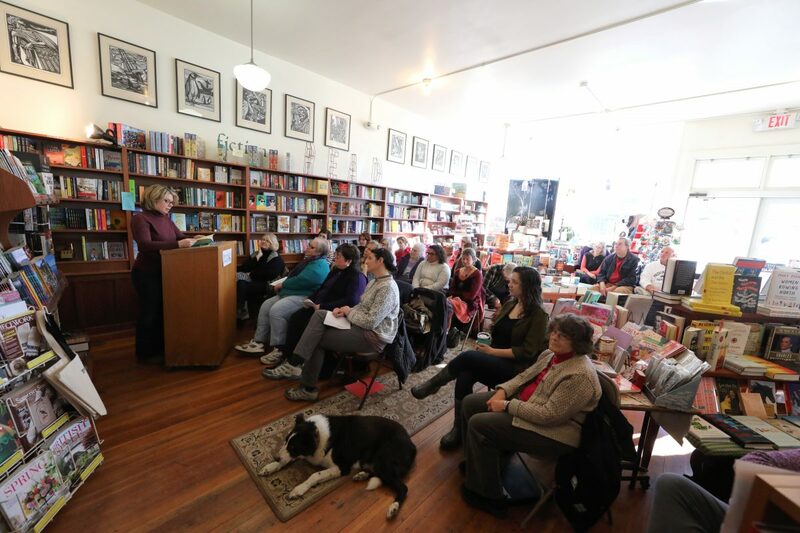 How kind of Connie Brooks to open up her bookstore to us, and how great of these people in my class to come and open themselves up to the world of the writer, to come out in public and show their fears and hopes and passions and vulnerability. Writing is all about coming out, and today was a great coming out. It was an enormous affirmation for me, it made me so glad I had committed to teaching writing and kept on doing it for years. I knew these people would eventually turn up if I stayed at it, and how lucky I am that they did. This was a wonderful afternoon for me, I came home so drained I collapsed on a living room chair and woke up more than two hours later, Bud dozing on my chest. Creativity is my faith, writing my first love. Today was a celebration of both, and not just for me. Thanks to the fates for a wonderful afternoon. An awesome entry. Already reading some of these blogs and now more to read. Wish I lived closer to Battenkill, but the blogs will have to suffice. What a lovely day. I have been reading your blog for past ten years now. I remember the days when we didn’t even have a face to put your words too. Your photos were lovely but none of you. It’s been a wonderful journey with you watching you bloom, and share what you have and where you are. Thanks John. And Maria. Thank you and your wonderful students for sharing your stories and poems yesterday afternoon. I was blown away by their talent and creativity. And I was deeply touched by their stories. It was an absolutely delightful afternoon. I also enjoyed meeting you, Maria and Red. Thank you again.